June's Birchbox doesn't feature a 'pick your sample' but does feature 'pick your box' in collaboration with shoe brand French Sole. There are three designs to choose from which include my floral design 'Floral Daze', a white and navy blue striped design featuring a red heart 'From Paris with love' and a Licorice Allsorts type design Pick n' Mix'. This months lifestyle bonus item will then be a shoe bag that matches your box design. The 'Step outside' theme goes with the collaboration with a shoe brand (as you obviously need to wear shoes to go outside) but also represents stepping outside for the great British summer (which to be honest you're more likely to need wellies for!). The first product I spotted in my June 2015 'Step outside' Birchbox* was the Cowshed Knackered cow relaxing body lotion. To begin with, how cool is that name?! Instead of Knackered cow you might receive Gorgeous cow and the brand also offer products under Grumpy cow, Lazy cow and Horny cow! I've heard of Cowshed but haven't tried any of their products yet. I'm always up for trying out a new body lotion in my quest to find the perfect one but as this one contains lavender I'll be passing it on to my mum. This is a 100ml sample (full size 300ml for £20). Next up I spotted the Beauty protector Protect & Detangle. This is a styling spray that minimises frizz, safeguards colour, adds shine, detangles and works as a UV and heat protector. It also apparently smells like candy floss and bubblegum, but I'm not entirely sure about that. I have been trying out some new heat protection sprays recently after fancying a change from my Tresseme one, so I'm looking forward to trying this out. I can't find a size on the bottle but the full size is 236ml for £14. The REN sample is the REN Keep young and beautiful Instant firming beauty shot. Now isn't that a bit of a mouthful! I think this might be a new product but I've tried very few REN products anyway (if any actually). I know REN products are very popular with bloggers so I have high hopes for this. This is a 10ml sample (full size 30ml for £36). The lip balm is a Pixi by Petra shea butter lip balm in Ripe raspberry. You might get this in Honey nectar or you might receive a Pixi makeup product. I'm very pleased I received this in Ripe raspberry as I'm not sure I would have like Honey nectar as I'm not a huge honey fan. Like most people I have about a squillion lip balms lying around but this will actually be going straight in my handbag. It feels super smooth and buttery on the lips and although the actual balm is a raspberry red shade I didn't realise until I looked in the mirror that it is actually a tinted balm. This is getting a big thumbs up from me! Full size worth £8. Sigh...at the bottom under these products I found a perfume sample of Panhaligon's Iris Prima. I'm sure by now you know how I feel about tiny perfume samples in beauty boxes but if you're not aware I'm not a fan. If it had been a beauty bonus item I wouldn't have mind too much but this is actually one of this months samples. I've had a squirt and I'm really not a fan, which is a good thing as it starts at £85. However there is a beauty bonus product in the box and this is STYLondon Temporary metallic tattoos. I believe these have become really popular recently and I've been curious to give some a try. I have a wedding coming up in August that I thought I might save these for but now I'm not so sure that they'd be appropriate for a wedding? Anyway I'm looking forward to having a play around with these at some point. The pack is worth £7.99. As I've already mentioned the last item in the box is the lifestyle bonus which is a shoe bag. You might be thinking 'what on earth do I need a shoe bag for?' but actually if you travel these are really useful as they stop shoes making your clothes dirty in your case and also can just be used to store shoes in to stop them getting dusty (or a spider moving in!) if you've not worn them for a while. Apart from the perfume sample I'm very happy with this box and if I liked the perfume and could use the body lotion I would use all of the products included. 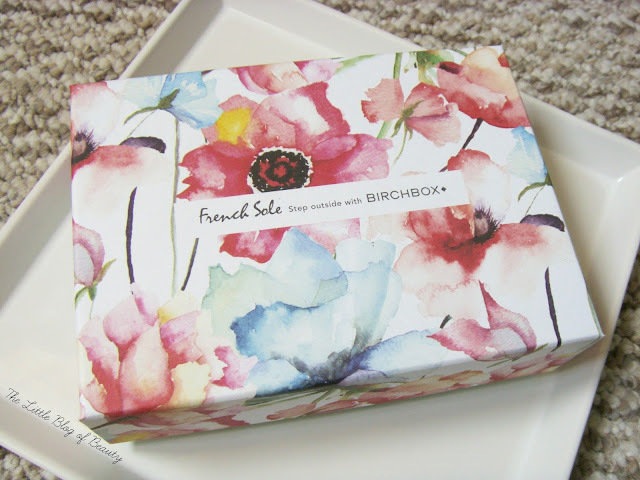 If you like the look of the June Birchbox you can sign up on the Birchbox website here. What do you think of the 'Step outside' box? This looks like an interesting box, I have never been one for subcription boxes but I'm getting more and more tempted each month when I see these reviews popping up. An interesting mix of products :) at least they didn't have a foot theme with the products. I can imagine the riots!